Small internal capacity for basic maintenance tools only. Available in black or brown, £40 each. 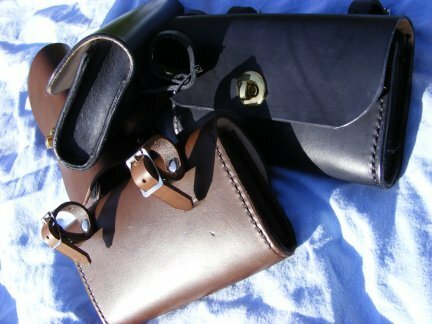 Genuine leather, old-style toolbags suitable for fitting to cyclemotor and cycle frames. Style—Large Cyclemotor 8½"×7"×2", £40 each. Style—Large Cycle (narrow) 8½"×7"×1½", £40 each. Style—Small Cycle (narrow) 7"×5½"×1½", £30 each. Large sizes accommodate folding plugspanner, narrow widths clear 3-speed gear cable. 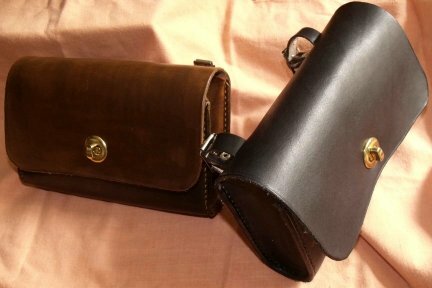 All available in black or dark brown - please specify colour when ordering. 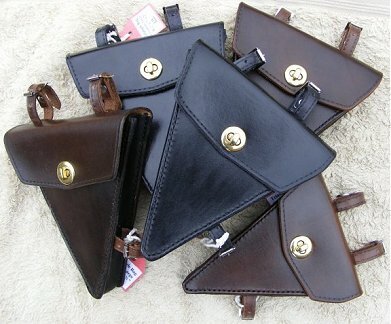 Genuine leather, old-style toolbags suitable for fitting to cyclemotor, autocycle, moped, and cycle saddles. Fixing by ½" wide leather straps, with plated buckles. Typically hold spark plug spanner, spare plugs, pliers, small screwdriver, cycle spanner, etc. 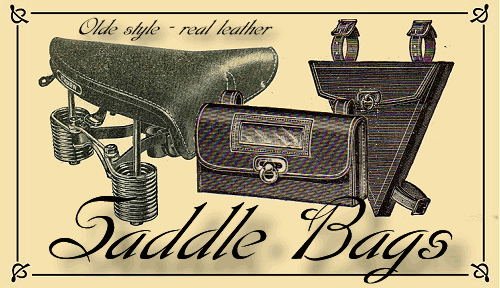 Style—Cycletool Standard 7"×1½"×4" @ 4"strap centres. £30 each. 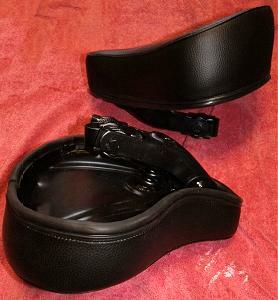 Style—Autocycle tool Wide/Standard 10"×1½"×4" @ 5" strap centres (with 2 turn-button clips). £45 each. 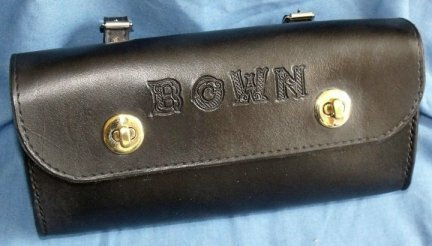 Picture illustrates bag with "Bown" lettering. Any specific text/design can be added as required to any bag types (to special order). Style—Autocycle tool Extra 8"×2"×4" @ 5" strap centres. £40 each. All available in black, dark brown or ‘Antique’—please specify colour when ordering. Large, semi-rigid double pannier set 34×30×12cm in Green. £30 pair. Top flap with double clip & 2× side pockets + reflective strips. Medium, HD Nylon-bag double pannier set 29×29×12cm in Black. £20 pair. Top flap with Velcro closure & 2x zipped pockets + reflective strips. 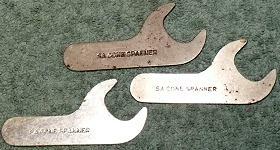 Sturmey–Archer Cone Spanner, ⅝" A/F—£1 each. 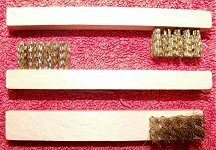 Brass-bristle 4" miniature spark plug brush—£1. ‘BTG’ Bategu rubber covered seat 10½" × 11½" c/w ⅞" diameter stem mounting on compression rubber sprung frame. NEW—£85. As originally fitted to early Puch single seat models and other continental mopeds. Replacement rubber covers also available in black, light grey, and cream. New—£40 each. 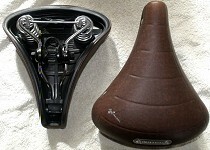 Deep foam/sprung single saddle—£40 each. ‘Extra comfort’ 2½" thick foam pad. Black vinyl cover. Steel baseplate with sprung mounting. Clamp to fit ⅞" stem. 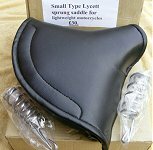 Slim foam/sprung single saddle—£40 each. ‘Standard comfort’ 1½" thick foam pad. Black vinyl cover. Steel baseplate with sprung mounting. Clamp to fit ⅞" stem. Eurathane moulded seat (in black), with standard ⅞" stem mounting—£12. 10½" long (end-to-end) × 8" wide (wing-to-wing) × 2½" depth. The stem mounting clamp of this seat secures very firmly on the seat post, it’s a good solid fitting and doesn’t wobble about. The proportions are such that it doesn’t look out of place on typical mopeds, while the eurathane moulded seat is comfortable to ride and pretty effective at absorbing vibration … and it’s amazingly cheap! Extra-wide Eurathane moulded seat (in black), with standard ⅞" stem mounting—£14. 10¼" long (end-to-end) × 9¾" wide (wing-to-wing) × 2½" depth. The stem mounting clamp of this seat secures very firmly on the seat post, it gives a good solid fitting and doesn’t wobble about. The proportions are such that it doesn’t look out of place on typical mopeds. The ‘extra-wide’ eurathane pad gives a little more support than the ‘standard saddle’, delivers a comfortable ride and is reasonably effective at absorbing vibration … and is still amazingly cheap! Traditional appearance with dark brown cover, chome springs, and chrome wire frame. ‘Selle Royal’ badge on back. Super comfortable gel foam padding. 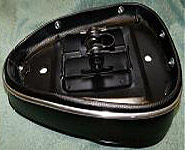 Plastic moulded base with 2 integral saddlebag mounts at 3½" centres. C/w 7/8" stem mounting clamp. Dimensions: 8½" wing-to-wing, 10" front-to-back, 3" depth. 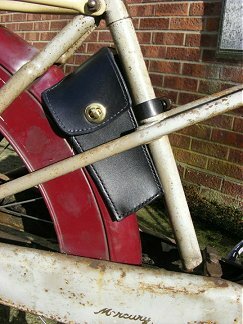 Very period style, best suitable for cyclemotor, and maybe old mopeds too. 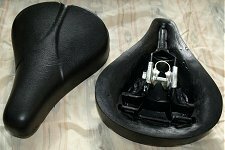 Selle SMP compression & tension sprung foam pad saddle. 10" wide × 11" long, ⅞" stem mounting. Very comfy for a moped. Black cover. 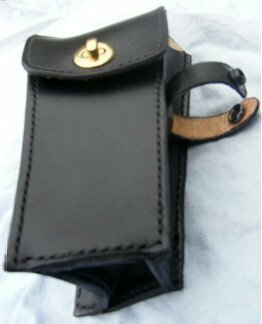 Also has saddlebag mounting straps at 3½" centres—£20. 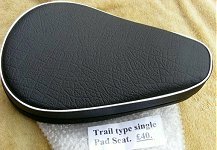 Trail type foam upholstered pad seat, on steel pan. 15" long × 10" wide, 4 × 8mm rear fixings 120mm × 60mm spacing, 1 × 8mm front fixing 200mm spacing—£40. Triangular Pad saddle, Black—£50 each. ‘Firm comfort’ 2" high density foam pad, 1ft long × 9" wide. Vinyl cover with polished stainless-steel trim around edge. Steel baseplate with solid mounting and clamp to fit ⅞" stem. ‘Well finished and nice quality saddle’. 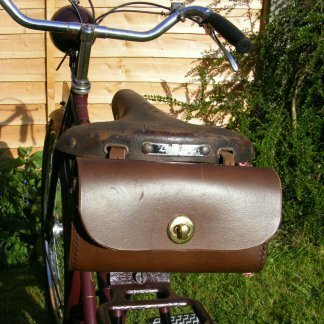 Similar style to the ‘Super Comfort’ pad-saddle as fitted to Raleigh RM4 & Norman Nippy Mk5, and similar style to Denfeld matress sprung saddle as fitted to Raleigh RM11 Super Tourist. Now available in new colour cover options. Dark grey sides with cream top and red piping—£50. Black sides with red top and white piping—£50. 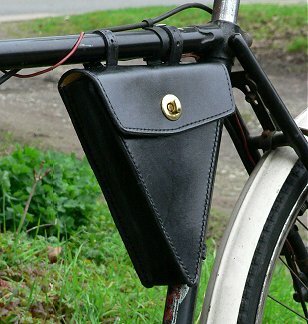 Small Lycett pattern traditional style sprung saddle for lightweight motor cycles (inc 2 × chrome plated springs), £40. 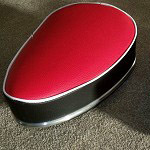 Replacement cover for lightweight motor cycle ‘Small Lycett pattern’ sprung saddle. Size 12" front to back / 12" frame across inside. Includes fitted strips for clipping to frame. £22 each. Note—These are NOT sized to fit Autocycle saddle frames, which are 10½" front to back / 11" frame across inside. ‘Wittkop’ rubber seat replacement cover in black. NEW—£50. Note—this will only fit Wittkop seat frames, and NOT any other makes. Wittkop brand is identified by a ‘Spider’ logo, usually moulded in a circle to the back/top of the cover. 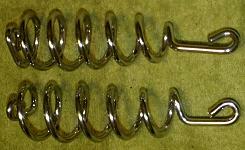 Lycett pattern light motor cycle new chrome plated saddle springs for rigid frame type seat—£8 pair. 7½" long × 2" diameter × 5½ coils × 6mm diameter wire. 1" diameter main post with ⅞" diameter saddle clamp at top. 13" long (though can easily be cut down from the bottom if a shorter stem is required).